Whether you are moving locally in Ledbury, Herefordshire or further afield we can offer you a safe, secure moving service to suit your needs. As a family-owned business started over 30 years ago and members of the BAR (British Association of Removers) we are here to help with your house move and if you need extra services such as materials for packing or, some packing assistance, (whether the whole house or just the kitchen), we will have an option to suit your moving requirements. Still used by market traders today, The Market House dates from the 1600’s and was used for the storage of corn, wool and hops (not something we tend to store for our modern day customers!) before its eventual restoration and use as a Town Hall – today it is used for meetings. 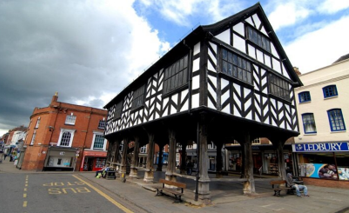 If you are moving house in Ledbury or, moving business premises we will have a solution to meet your needs. Our fleet of removal vehicles ranging from Luton Transit to 7.5 Tonne (medium sized), 10 tonne, 15 tonne and above mean we can help you save money throughout the removal process, tailoring our service whether you are moving across Herefordshire, nationally, or internationally. We can offer you safe, secure storage solutions dependent upon whether you need regular access to your effects or long-term Ledbury storage. Our team will be pleased to help you choose the best solution whether you require Self-storage; Container Storage; External Storage; Internal Storage; Holdover Temporary Storage. See our Get a Quote option below or Contact Us now. Running out of time to pack and prepare for your move? Perhaps our packing service is the answer, you may need our full packing service which includes packing of every item that needs to be transported in a box or, maybe you simply need your fragile items packed, if you don’t have enough time or simply cannot manage this time-consuming job, we will undertake your packing, professionally, carefully and quickly. Ask us for a quote to pack, you may be surprised about how cost effective this is and it means less stress for you before your move. Why not use our Removal Guide to help you remember the list of things to need to do when you are moving house. On the countdown to your moving day, we’ll make it simpler and as organised as possible to suit your timescale.